During its natural movement the knee makes a rolling and sliding motion, so the size of the motion itself depends on the position of the center of rotation reached between the articular joints. This implies that there is a difference between the knee angle measured with a goniometer and the real distance covered by the knee. The above exposition is confirmed by the fact that while the goniometric system can be guaranteed with a fixed point of reference, after an initial circular rotating phase, the flexion/extension of the knee, a combination of rolling and sliding takes place and thus a gradual decrease in the distance between the instantaneous center of rotation and the articular surface. 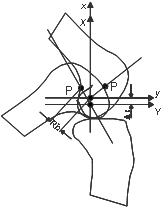 This implies that the flexing angle reached by the knee after having done the physiological movement, is different from the corner assessed only with a goniometric system; as a matter of fact, the correct evaluation of the motion of the knee, must take into account the instantaneous displacement of the center of rotation. To make this concept clearer, it is essential to consider a reference system (x-y) in which the x-axis overlaps with the longitudinal axis of the leg with the thigh when limb is stretched out. The y-axis intersects x in the initial center of rotation of the knee and it anatomically goes horizontally through the femoral condyle. If we wish to describe the gradual displacement of the center of rotation of the knee, it is essential to establish the first rotating radius Ra. 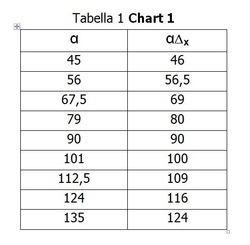 Ra is placed on the y axis and it extends from the origin center of the x-y untill reference point P (Fig. 2). During the first 30 ° of flexion/extension (Fig. 2) one end of the radius Ra revolves around the origin of the reference system x.y and the second end (P), follows a circular trajectory. Moving from 30 ° of flexion/extension on (135 °) the center of rotation, initially placed in the origin of the reference system, slides vertically to the articular surface along the x axis by an amount equal to Δx. The radius Ra remains unchanged in its length and drags point P on a downward spiral receding toward the center. This determines that the distance between P and the origin of the reference system x-y is reduced (Rb). Therefor, after 30 °, Rb, whose first end is always centered in the origin of the reference system x,y when changing α, it will assume different angle values than those of Ra, which remains the true radius of rotation of 3the knee. Correction factor As from the above we can state that there is an effective difference between the actual angle at the knee and that angle measured with a traditional goniometer. These differences are dependent on the distance between P and the origin of the reference system x-y (Ra). Potentially, this difference has got ripercussions in the case of a therapy that may prefigure a device to make the knee flex upon a precise amplitude, the preset range of motion to make the device move, will not be the “GONIOMETRIC” one normally used by all devices currently on the market, and thus the knee will be FORCED (after 90 °) at a bigger angle, an angle that does not match the one required by the physician’s prescription.